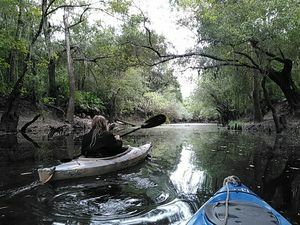 Come paddle the idyllic Withlacoochee River in its most urbanized area, Valdosta, help clean up trash, and do kayaktivism against the Sabal Trail fracked methane pipeline, which would cross only a few miles downstream. This is a WWALS Field Trip from Langdale Park upstream to the North Valdosta Road Bridge, Saturday morning October 3rd 2015, in support of the VSU Anthropology Club, the VSU Sociology Club, and Students Against Violating the Environment (S.A.V.E. 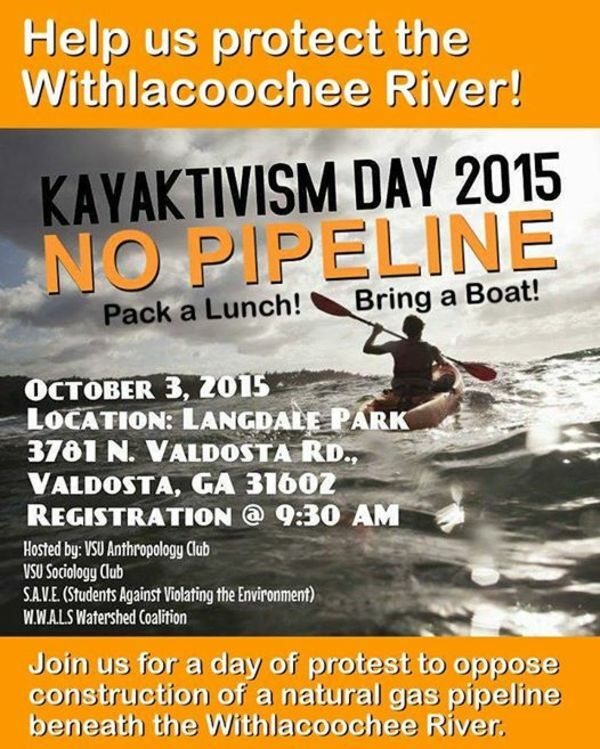 ), who invite you to Kayaktivism Day 2015! 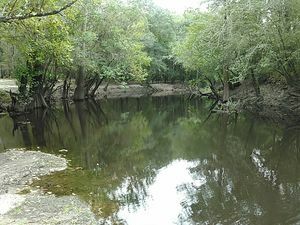 If I’m not mistaken, Keep Lowndes/Valdosta Beautiful (KLVB), which is having its annual Rivers Alive cleanup the same day, will send some volunteers to the same site at 8:30 AM, so come early and help clean up! 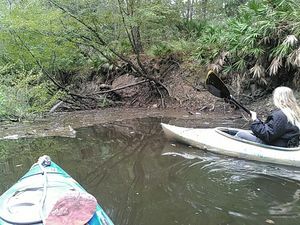 What: First pick up trash, then paddle upstream, lunch near the N. Valdosta Road (US 41) bridge, and paddle back down. 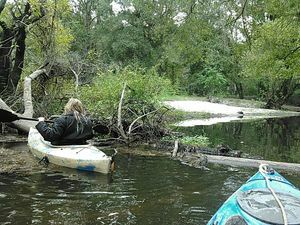 Duration: For the paddle, it took us about an hour yesterday Friday, and we were really dawdling. Add in lunch, and maybe an hour and a half, or call it two hours for time for registration first. Deadfalls: Who’s in charge of removing those? Water Level: Hovering just below 4 feet on the USGS gage on the US 41 bridge. If it gets lower, there will be more portaging, unless somebody will take responsibility for removing those deadfalls. Backup Plan: There is none. This is a Field Trip, not a WWALS Outing, so if there’s massive rainfall we’ll cancel. 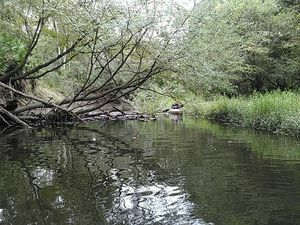 The formal WWALS Outing for this month is Sullivan Launch to Blue Spring, Withlacoochee River Outing 2015-10-24. Y’all come! The access point for Kayaktivism this Saturday, Langdale Park Boat Ramp, is one of the access points for the Withlacoochee and Little River Water Trail. 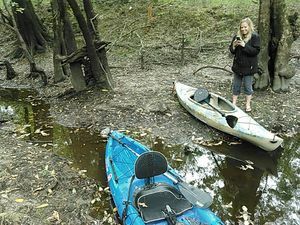 It’s about ten miles upstream from US 84 and where Sabal Trail wants to cross. For pictures there, see previous post. 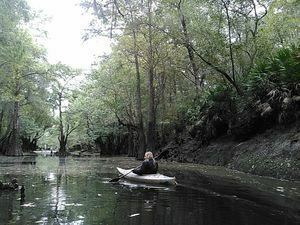 Just upstream from US 84 is where the Georgia DNR board last Wednesday gave away an easement to Sabal Trail. It’s not final unless the legislature approves it, and it’s useless if Sabal Trail doesn’t get some other permits. Don’t forget the FERC meeting about Sabal Trail 6PM Wednesday 30 Sep 2015 at the Holiday Inn, 1805 West Hill Ave., Valdosta, GA 31601. Other nearby FERC meetings are Monday in Albany, Tuesday in Moultrie, and Thursday in Lake City, FL. 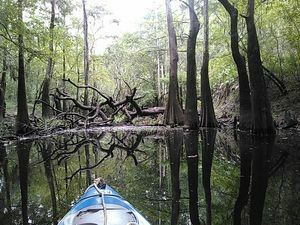 And don’t forget the hearing 19-22 October 2015 in Jasper or Live Oak, Florida in which WWALS is fighting for the Suwannee River and the Floridan Aquifer against a permit the FL-DEP proposes to issue. You can support that legal work directly by contributing to the WWALS IndieGoGo crowdfunding campaign. 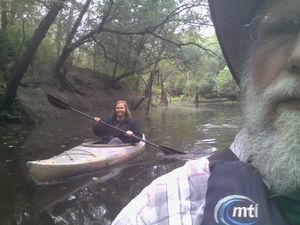 Yesterday Friday Ashlie and I paddled the route for next Saturday’s kayaktivism. Click on any of the pictures below for a larger version. 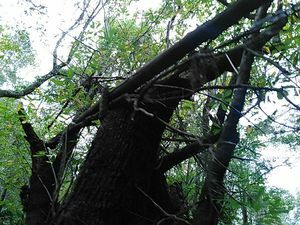 Lowndes County says GA DNR is in charge of removing deadfalls. So we went to the other side of the parking lot. We’ll probably string a rope or something to make it even easier. Really, who’s in charge of removing deadfalls? And we can probably remove much of that loose stuff by wading with boots and gloves. Well, this one is fun to go around, at least. These logs seem to have been piled up here for quite a while. Can we get them moved before next Saturday? Driving over that bridge on the busiest highway into Valdosta, you hardly notice the river. Looking up from the river, it’s actually quite a bridge. Langdale Park actually is just outside Valdosta in Lowndes County. But above the bridge on the east, to the left in this picture, is the Country Club, which is inside the Valdosta City Limits. 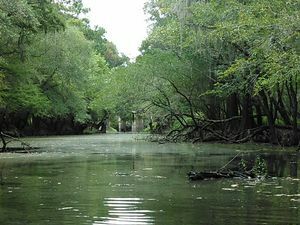 The Withlacoochee River is the city limit right here. 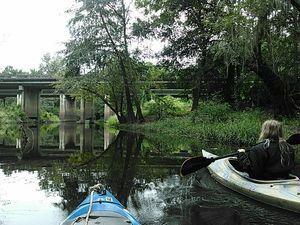 Just a few miles from I-75, right next to the biggest city in the entire Suwannee River Basin. A tad greenish, but pretty good. As in it was 15 feet higher just last December. Seems like some of our tax-supported local governments could take care of this. 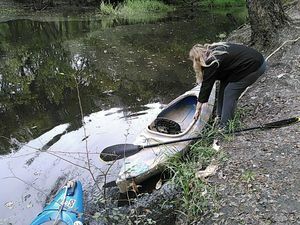 But deadfalls or no, next Saturday is Kayaktivism Day! This entry was posted in Blueway, Pipeline, River and tagged Ashlie Prain, Cleanup, conservation, Georgia, Keep Lowndes/Valdosta Beautiful, KLVB, Langdale Park, Lowndes County, north Florida, pipeline, river, Rivers Alive, S.A.V.E., south Georgia, Students Against Violating the Environment, Suwannee River, Suwannee River Basin, Valdosta, Valdosta State University, VSU, VSU Anthropology Club, VSU Sociology Club, watershed, Withlacoochee River, WWALS, WWALS Watershed Coalition on September 27, 2015 by jsq. Thank you, John! This is great! Holy cow, a couple of guys (or good ol’ farm girls) with chainsaws and one afternoon and ya’ll could have that deadfall situation resolved. Or you could keep complaining to the gooberment, which in my experience is about the least effective way of getting anything done. DNR can’t pay for half the things they need to be doing, and are wanting to raise hunting/fishing license fees again. 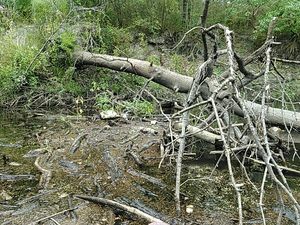 I doubt a downed tree in a mostly non-navigable waterway is high on their priority list. Up here on the Ocmulgee if you need to get around a bad deadfall you can cut it up yourself or sit there waiting on somebody else to come along and do it for you, in which case you might be waiting a long time. A couple of guys with a chainsaw did clear a path. Meanwhile, county mowers came by and made land access easier. Local citizens and local government working together! 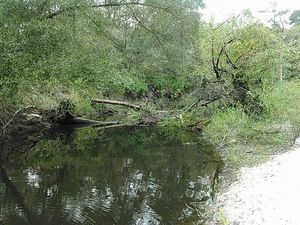 The big deadfalls still need to be removed. Despite what the county says, I’m pretty sure it’s their responsibility,not DNR’s. We shall see. 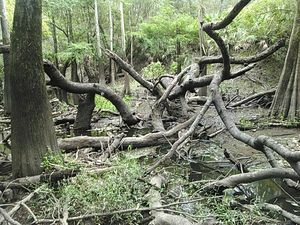 One of the reasons a watershed organization such as WWALS exists is to get local governments to do water-related things they should be doing anyway, ranging from explaining the Valdosta wastewater situation to the county building a boat ramp to clearing deadfalls.